JP stamps are an invaluable tool. Any Justice of the Peace knows how much a stamp will save you time when it comes to witnessing and signing documents. We have JP Stamps for NSW, ACT, QLD, VIC, NT, TAS, SA and WA. Our range also includes the new JP 003 ruling. If you would prefer to get your stamp made as a hand stamp, just let us know and we will quote this item for you. The stamps showing below are separated into States and are for Self Inking JP stamps. To ensure that you get the maximum impressions from your Inking stamps, we suggest that the stamp is not exposed to strong sunlight as this will result in the pad drying out. When your stamp needs to be re-inked we can supply the correct pad or ink to replace or refill your machine. Use of the correct ink is very important as the wrong ink can affect the life of the stamp. Contact us if none of our templates are suitable. You can choose from the templates below and clicking on them will take you straight to our online store. If you would like to design your own Simply email your request to us with the wording and the dimensions of the stamp and we will send you a proof for your perusal. The states are set out below. Clicking on each state will show ALL of the JP stamps for that state. 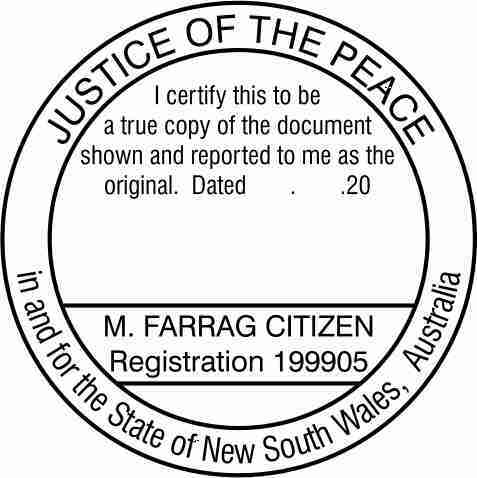 If you wish to search for your stamp by its type ie: Name and Number or Certifying go to the Menu bar at the top of the page and hover over “Justice of the Peace” then choose your state and the different categories will drop down. You can purchase our Self Inking stamps online. Choose from the menu bar at the top of the page or view the stamps available from the imagery above. The courier charges shown on the order form are incorrect. Freight Charges are listed on the Main Menu. To place an order simply choose your stamp from above images to go straight to our online store. To obtain a quote or to see our full range please email us from the link below. Alternatively you can print out the order form and fax or email us.